"The Original Highway Code" takes you on a nostalgic trip down memory lane, recalling a golden age of motoring from more than half a century ago. The booklets are a fascinating illustration of changing times, from the instructions for signalling with your whip before the introduction of indicators to the appearance of traffic lights in the fifties. The first booklet, published in 1931 was a mere twenty-four pages, including advertisements for BP, the AA and motoring publication "The Autocar".It is drawn upon and illustrated in the introduction, and the booklets from 1935, 1946 and 1954 are reproduced in full with commentaries to establish them in their social and historical context. In the 1935 booklet the advertisements are jettisoned and in their place the new road signs and rules of the road are fully explained. In 1946 the booklet is smaller due to post-war austerity measures and the final booklet from 1954 introduces colour in order to explain the new traffic light system. 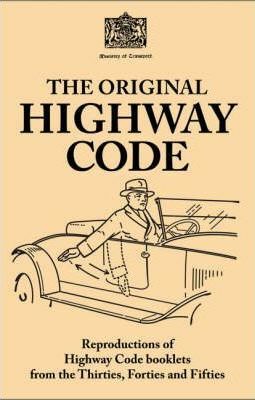 A fantastic gift for everyone interested in motoring, "The Original Highway Code" is a charming glimpse back to a bygone age.